I have to share with all of you a Cute little fellow who has been quite a Stir in this household recently. How clever He thought He was and I have to agree...I thought so too!!! Happy Warm Hugs to All!! it would get a little cooler here in Ga.
Another 90 degree day today! inspired items for a Fall Swap. pictures for you to see. so it is royalty free. I wanted to share my latest little creation with you today. Votes needed!! Calling All Followers and Friends Of Art of Mine!!!! for making ATC's aka "Artist Trading Cards". 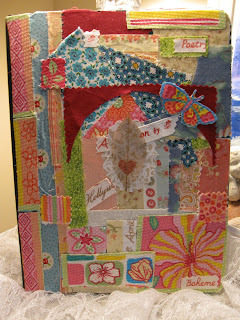 Wendy and Debbie over at "Blissfull ATC Swap"
all of our lovely ATC's that we are accumulating. and Friends out here in Blogland!! white netting over the top and made a total of 21 pockets. ribbon and some pretty cream and pink trim on the top. to the shabby white wire holder. sturdy enough to hold the ATC's. 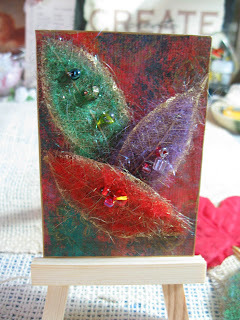 I posted the Beautiful ATC that Carol Anne made for me and today she has posted the one I made for her...so now I will show all of you the one I made for Carol Anne. I tried an experiment with some skeleton leaves I had and wool roving. The leaves are pretty fragile but I thought if I "carefully" felted some wool roving into them that they might stand up to the needle punching, and they did! I also added some Angelina fibers to the wool, each one with a coordinating sparkle of color to each leaf. I used a gold leaf pen to highlight around the edges of the leaves as well as the edges of the card! Added some beads and viola!!! 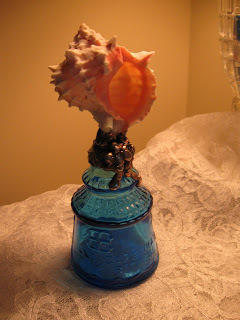 Please go visit The Blissfull ATC site that you will find on my sidebar. We are having an "ATC Holder Challenge". We are all making one of a kind holders for our wonderful ATC's, the one with the most votes wins the Challenge!! 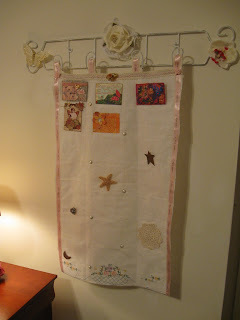 If you like my ATC Holder please put in a vote for mine!!! Thank you!!! Love to all and Enjoy your Day!!! A Great Monday to All!! the first indication of what loveliness was inside, for it had beautiful Fall leaf stickers surrounding one corner of my name. 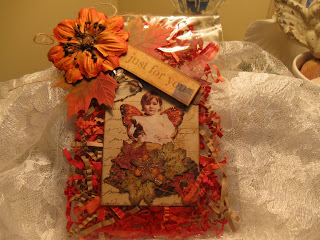 Upon opening the envelope inside was this beautiful cellophane envelope with as you can see a lovely Fall flower and Leaf with a sweet tag. The packaging was so beautiful I had a hard time deciding to open it... but of course I had to hold the precious ATC inside. Isn't this absolutely precious?? Carol-Anne You are Amazing!! Thank you for making this card with so much thoughtfullness and love. I will cherish this sweet little card forever!! Please go visit this wonderfully creative Lady. 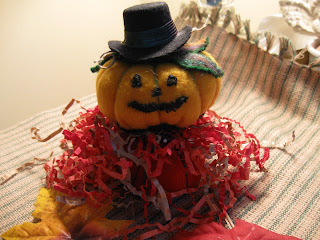 at: carolannesboutiqueblogspot.com. I wish you all a Fantastic and Lovely Day!!! she is an extraordinary artist!! As promised I am posting some more pictures of our time down in Savannah and Tybee Island. This is my son Andy down by the water front in Savannah. We checked in and then we headed down by the river. by the river. After dinner we went on the Ghost tour of Savannah in a lovely black hearse!! Our driver is also a Fireman for Savannah so he had some very interesting tales to tell us!! This is one of the mighty Tug boats that push and pull the huge container ships that go in and out daily throught the Savannah river. Hope all of you had a fantastic Labor Day Weekend!! Savannah, Ga. for a few days. but not a ghost in sight!! and see whats new with you all!! I won a lovely Giveaway!! Hope your day is going well for you!! 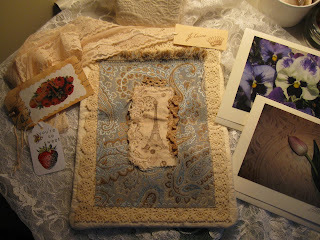 I wanted to show you what I won a few days ago from sweet Marilyn of "Willow and Figs". 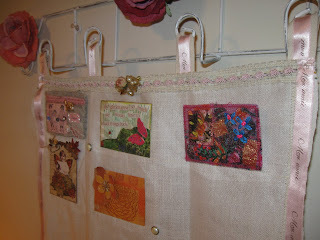 Marilyn makes wonderful fabric collage items and some are these beautiful "Prayer Purses"! I received my Beautiful Prayer Purse today along with some lace to make a strap for it. Marilyn also included a charming little bag to maybe store sunglasses in. Marilyn also makes lovely cards and she gave me two one of which is a gorgeous picture of Pansy's...how did she know I love them so much? She also included three cute little tags!! Thank you Marilyn for your wonderful Giveaway and your sweet gifts you gave me. Please go visit Marilyn and also her Etsy shop. You will absolutely love the things that she creates!! 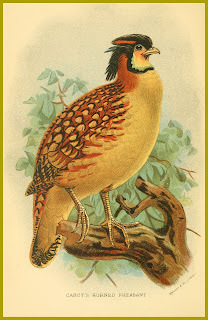 http://cordeliashouse.blogspot.com/ I will be going on a little mini vacation with my oldest son to wonderful Savannah, GA. Hoping that Earl the Hurricane will stay out to sea!! !